Hrithik Roshan is a popular actor of the Bollywood movie industry. His handsome looks, great body and agile dancing style have made him win many hearts among his fans. He was born on 10th of Jan and is a Capricorn native by virtue of his date of birth. 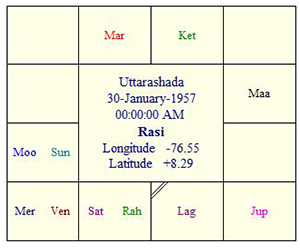 Planets Saturn and Sun influence the natal chart of Hrithik Roshan thereby influencing his personality as well. Under these planetary influences he turns out to be an adventurous individual with a deeply humanitarian streak. In the matters of relationships, Hrithik may appear somewhat aloof and distant. But that is his exterior approach. Deep within, he is highly sensitive regarding his relations and can make a real empathetic love mate.